After completing the vCenter HA course lab, when I looked into vSphere 6.5 SOAP API reference, I could see there are 2 managed objects exposed as part of vCenter Server High Availability as follows. In part 1, I am going to demonstrate how can we manage vCenter HA by using 2nd managed object listed above i.e. FailoverClusterManager. 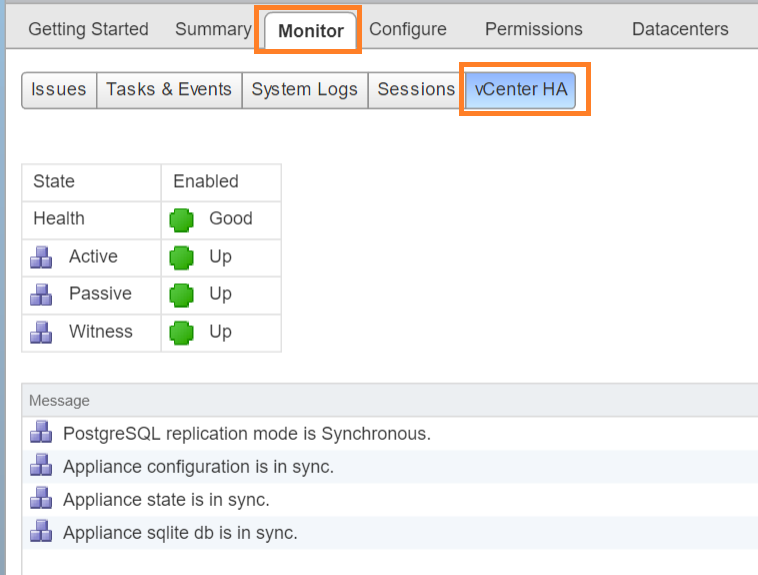 This managed object provides operations to manage a vCenter High Availability Cluster (VCHA Cluster) and it assumes that vCenter HA is already deployed. Accordingly, in my case, basic vCenter HA was already deployed. Let’s now see how can we invoke methods exposed by this managed object and fetch/set some cool properties using pyVmomi. If you still haven’t set pvVmomi environment, please do configure it using my earlier post “getting started with pyVmomi”. Here we go. If you look into API reference for managed object “FailoverClusterManager”, it has exposed total 4 methods i.e. getClusterMode(), GetVchaClusterHealth(), initiateFailover_Task() & setClusterMode_Task(). Let’s go one by one. 1. getClusterMode(): This method gets us the current mode that vCenter HA cluster is in: vCenter HA can be in one of the these 3 modes i.e. Enabled, Disabled or Maintenance mode. Let us look at what is the mode my vCenter HA cluster is in. Line 11 to 14: We have got “FailoverClusterManager” object, invoked getClusterMode() using it and finally printed the VCHA mode. Same is the VCHA cluster mode shown on below vSphere web client screenshot, is it not pretty simple to call this method? 2. GetVchaClusterHealth(): This method gives us overall health of vCenter HA. Line 13: We have invoked method “GetVchaClusterHealth()” & it returns VchaClusterHealth object. Line 15 to 18: We are fetching the property “healthMessages” offered by object returned above. Since “healthMessages” are multiple (array), we iterated and printed each one of them. Line 20 to 30: We fetched remaining properties of the object ” VchaClusterHealth”, such as vcha mode, vcha state & vcha nodeinfo etc. and printed them one by one. PostgreSQL replication mode is Synchronous. Appliance configuration is in sync. Appliance state is in sync. Appliance sqlite db is in sync. Note: Additional Information property returns “empty” array since VCHA cluster is in healthy mode. If cluster is not in healthy mode, it will provide additional info on what is causing the issue etc. If you see below web client screenshot, it is matching perfectly with above output. For IPs, you can refer the 1st screenshot already posted above. 3.initiateFailover_Task(): By invoking this method, user can initiate a fail-over from active node to passive node. print "Initiate Failover task is completed"
Line 12 to 16: We invoked method “initiateFailover_Task(True)” and waited for task to complete. Please take a note that we are passing boolean “True” into this method, which indicates that this method will wait till on-going active-passive state replication to finish and finally it initiates the failover, other wise it will force the failover, which can lead to data loss. As soon as I executed above script, I could see, as expected web client session was down and when I logged out of web client, I was happy to see below message on web client. If you want to know how to initiate failover directly from web client, please take a look at below screenshot. I waited for some more time and I could see web client was up & running again. Now I thought to check overall VCHA health to see whether VCHA is in healthy condition and active/passive nodes are actually exchanged or not. Accordingly I executed the script #2, which was written for getting VCHA health using GetVchaClusterHealth() and below was the output. As expected, VCHA was in enabled mode and healthy state, even active & passive node IPs were exchanged. Same was confirmed from web client as follows. 4.setClusterMode_Task(): Using this method user can change VCHA mode. Since my current mode is “enabled” & state as “healthy”, I can either set mode to “disabled” or “maintenance”. I decided to change VCHA cluster mode to “maintenance”. In maintenance mode, VCHA active/passive state replication is enabled but automatic failover is not allowed. Line 11 to 15: invoked “setClusterMode_Task()” method, waited till it completes and finally checked cluster mode by calling “getClusterMode()” method. Then immediately I looked into web client and I see VCHA mode was changed to “maintenance”as follows. That is all, How cool is that! I really enjoyed writing this post and I hope you will enjoy as well. Update: I recently published Part-2 on “FailoverClusterConfigurator” managed object as well. 1. All above scripts are available on my github repository as well. I have a plan to write one nice python module for the same. Note that for the sake of simplicity I have hard-coded some values & disabled certificate validation, please do appropriate changes as per your environment.